There is a belief that it's difficult to get rid of rats because they're smart. Some say that if you try to hit a rat and it manages to escape, rest assured that it will seek revenge – the offended rat will chew on your favorite shirt! And some of them know how to sniff a set-up. I tell you, I've come across one which actually refused to enter a cage trap, even when we tried to lure him in with an aromatic piece of meat. Based on the Chinese calendar, the Year of the Rat officially ends today. That means saying goodbye to a year of grave financial instability. But just like rats, our economic problems won't go away easily. That's why we all need to work together to change the course of 2009. 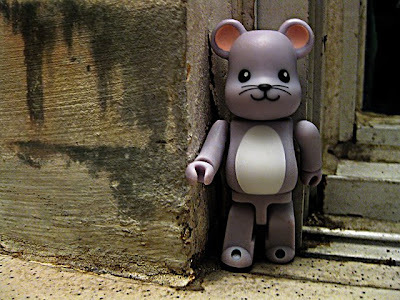 (Top) The limited edition Mouse Bearbrick, a Hong Kong exclusive. Produced by Mani Limited HK in cooperation with Medicom Toys.